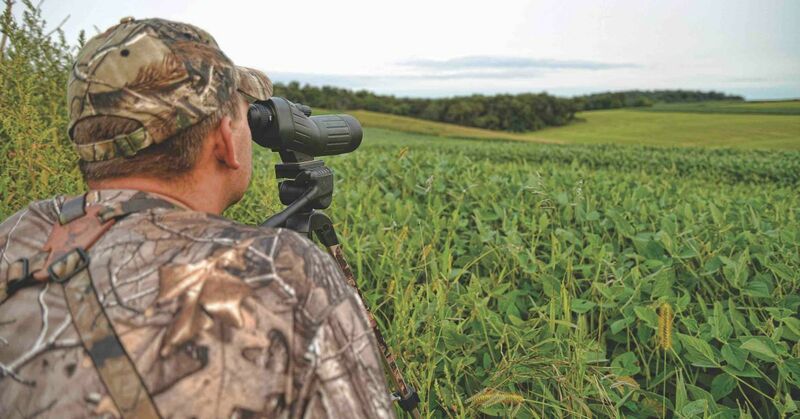 Many of today’s bowhunters rely solely on trail cameras to do their summer deer scouting. This might be a necessity for hunters who have access to small tracts of land, but for plenty of us, it’s just an easy way out. Cameras have their place, but they should be used to answer questions you can’t answer yourself by way of direct observation. Hanging a camera on a soybean field tells you what you already know, but that same camera positioned on a wooded trail leading to an overgrown homestead might reveal a crucial detail into a buck’s everyday life. Use your cameras to monitor areas you can’t watch, and develop a plan to glass the places you can. Observing a buck or a bachelor group munching on alfalfa over a few evenings in August can tell you a lot. First off, you need to be able to see how these deer get into and out of a given field. That matters, because you can start to make an educated guess on where they are coming from. You also get to observe them browsing along field edges, stopping by cattle ponds and using the terrain however they please. This also matters, because how a buck approaches a water source now may be how he’ll do it on November 2 when he is thirsty from a night spent chasing does. While glassing summer bucks, you can also make an educated guess on whether their chosen food sources will remain relevant by the season’s open. A green soybean field might be yellow on the opener, or that lush alfalfa might be cut down to a putting green, which will change your strategy. This gives you the chance to develop a backup plan for those early sits, especially when you compare your in-field observations with what your cameras capture in the cover. For more on summer deer scouting, check out this in-depth article by Bowhunting World Editor-in-Chief Jace Bauserman.